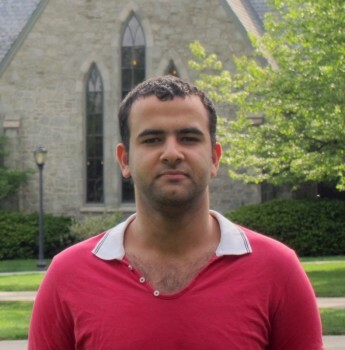 When he started at Haverford in the fall of 2010, Mohamed Abdalkader '14 was shocked by the critical thinking his professors asked him to do. Growing up in Egypt, his educational experience had been marked by rote memorization and regurgitation. After being exposed to the kinds of analysis and reflection that marks a Haverford liberal arts education, Abdalkader was eager to teach those new skills to students back in his homeland. Initially he began by sharing his experience with his friends and the younger students from his former school through the Hanet'alem Sah Initiative, a project he started with other college students in 2010 with the aim of providing high quality education to all Egyptians. From that work came the idea for another program that would act as an incubator for educational initiatives that would prepare students to play an important role in the development of their society. The computer science and political science double major has now been awarded a $10,000 Davis Projects for Peace grant to establish such a program. His proposed Futures Factory is a multipronged project that he will work to implement in Cairo over the summer. The Futures Factory will encompass four operation centers, including a physical space for education activists and volunteers to meet and organize; a work- and playroom for children under 12-years-old; and a center that will run programming for middle and high school students, as well as offer health education and teach math and literacy skills to adults. Finally, the Innovation Center will also house space for teaching computer and technology classes. Stephanie Zukerman, program assistant to the Center for Peace and Global Citizenship (CPGC), which selected Abdalkader's project to represent Haverford to the Davis organization, says that the steering committee chose his project because it had great potential for sustainability.“He showed great initiative and entrepreneurship through addressing educational disparities in his home country,” she says. Now in its fifth year, the Davis Projects for Peace invites undergraduates at the 94 American colleges and universities that participate in the international scholarship program Davis United World College Scholars to design grassroots projects that promote peace around the world. It is funded by Kathryn Wasserman Davis, a lifelong internationalist and philanthropist whose current commitment of nearly $1.25 million will finance more than 100 new peace projects this year.